MessageExport add-on helps people get email out of Microsoft Outlook and save time by automating routine email chores. 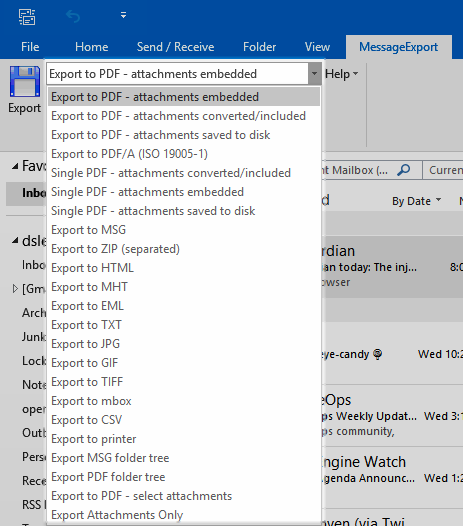 You can use MessageExport to save Outlook emails as PDF and other formats. It integrates with the Outlook toolbar to make it's functionality easy to access. MessageExport has many useful features and functions that can be combined in different ways to accomplish tasks efficiently. 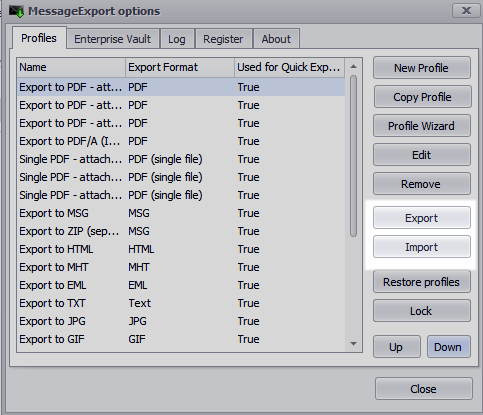 "Export Profiles" are sets of functions and features that tell MessageExport how to accomplish a task. These profiles can run automatically, on a timed basis, or manually from te MessageExport toolbar. Profiles are selected from the MessageExport drop down list. Export profiles are selected from the drop down list. Export profiles can contain file paths and log in passwords for accessing network folders. For that reason, it is possible to password protect any profile to prevent access or changes to the profile. To edit an Export Profile, click the "tool" icon from the MessageExport toolbar. We will discuss creating and changing export profiles in a future article. Today, we want you to know that the export profiles you build can be shared with others. From the Options>Profiles tab, select "Export" to create a xml file that can then be imported into another copy of MessageExport by selecting the "Import" button. By using MessageExport's Export Profile capabilities, you can easily make MessageExport an important part of your email workflow. By automating tedious email formatting and copying tasks, workers can save time and become more productive. When a useful export profile is created, it can be shared with other workers to help them also become more productive. 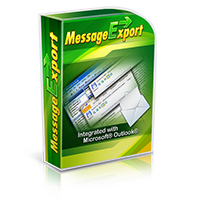 Learn more about MessageExport and download a 15 day free trial on the product home page.